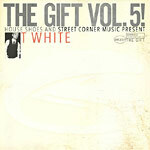 The fifth in the Gift series, where DJ House Shoes spotlights under the radar producers. ''Last spring I met T-White in Chicago thru my homies Denmark and Scud. Sooner than later the folders started coming thru. And now we got another one. The kid is super nice with his.... Enjoy.'' -- Shoes. These beats are on smash! Peep the broken, ambient but still bangin sounds on ''Bottom Out (Nope)''. The first beat ''Fly Crystal'' jumps out at you and you know this dude can bring it. ''Guide (Don't Panic)'' was another choppy joint I was feelin. This guy's style is so pure and it is evident on the smooth track ''Discovery (Wind Cycle Map)''. You're gonna love this one!